Whenever we hear the name General Douglas MacArthur, the first thing that comes to our mind was the promise he made after he was forced to leave the Philippines in 1942 which is the famous “I shall return”. He was able to realize this oath on October 20, 1944. It is one of the most remarkable events not only here in the Philippines but of United States as well. Hence, both countries commemorate the Leyte Gulf Landing or more popularly known as Leyte Gulf Landing every 20th day of October. It had been written down on history as the turning point of the World War II, we have read about it since grade school but there are still so many things we don’t know about this momentous event and the person who became the symbol of our liberation from the oppression of Japanese Empire. So let me take you back to one of the darkest time in the history of mankind and let us get to know the man who did not only changed the course of World War II, but of the entire world’s future as well. Just like any human, General Douglas MacArthur wasn’t perfect. Despite of his notable greatness he was still too far from being flawless, he was more of a man of contradictions. He wants his orders but he was at times stubborn to the point of insubordination. He was an excellent soldier and might be the best general America had ever had but he was also blamed for the remarkable blunders which cost lives. MacArthur was determined to recover his pride after he was forced to flee the country along with his family and members of his staff in PT boats Corregidor to Mindanao and escaped to Australia as ordered by President Franklin D. Roosevelt on March 11, 1942. His plan to avenge his temporary defeat was stated during a press conference held upon his arrival in Melbourne on March 21, 1942: “I came through and I shall return,” words which both Americans and Filipinos left here in Philippines held on to for a few years. MacArthur’s determination to fulfill this vow was again presented when he argued during a meeting with President Roosevelt at Pearl Harbor on July 27, 1944 that it was a moral obligation of the US to free the Philippines from Japanese oppression as soon as possible. Right after he was appointed as Commander-in-Chief of the South-West Pacific Area in April 1942, Gen. MacArthur began to plan his return and taking back Philippines from the Japanese but due to the progress of the war, he was not able to put this plan into action until 1944. MacArthur landed with the third wave, accompanied by members of the Philippine government and press had to step off into knee-deep water and wade their way ashore. 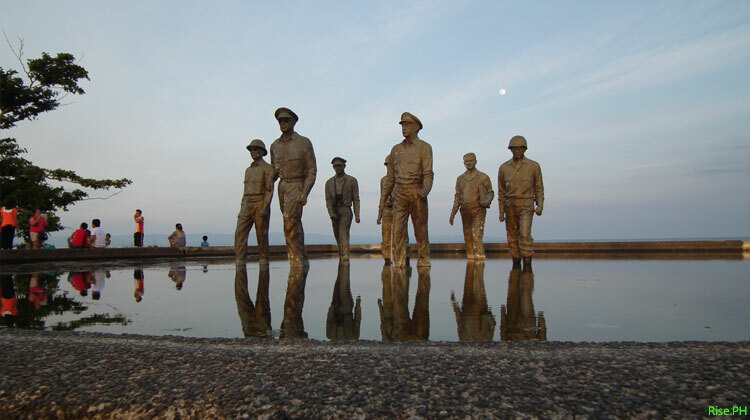 That moment was immortalized by the nine-foot bronze statues of him and his entourage at the Leyte Landing Memorial or MacArthur Park in Red Beach, Palo. He then triumphantly announced, “I have returned” and encouraged everyone to fight against the Japanese. The U.S. invasion of Leyte prompted the Battle of Leyte Gulf (23-26 October 1944), known as the largest naval battle in history of mankind. It was also the beginning of the end of Japanese occupation. A local boy scout Valeriano Abello helped the US warships redirect their artillery towards the Japanese soldiers using a white cloth diapers as semaphore flags, the 20-year old scout signaled the Americans not to bomb the beaches of Tolosa because there are civilians, he then paddled towards the nearest Allied naval ship along with his friends; Antero Zunia and Vicente Tiston to tell them the location of the Japanese troops. This heroic act saved thousands of lives and helped the Allied forces locate the enemies thus, a three-day celebration is held in the town of Tolosa yearly starting October 18 to commemorate the Signal Day. He was also honored with a monument at the seaside barangay of Telegrafo. So after the Americans successfully recaptured the Philippines and the atomic bombings in Japan, they are left with no other choice but to surrender. It was on September 2, 1945 that MacArthur officially accepted Japan’s surrender aboard the USS Missouri in Tokyo Bay. So why was the Philippine Island so close to General MacArthur’s heart? 1. After graduating first in his class in 1903 with the highest scholastic average at the academy earning 2,424.2 points out of a maximum of 2,470, (only two other cadets in West Point history had matched MacArthur’s 98.14% performance) the young Lieutenant sailed to the Philippines for his first military assignment. As part of the 3rd Engineer Battalion, MacArthur was assigned to supervise the construction of a warf at Capm Jossman in Iloilo in October 1903. He also conducted surveys at Tacloban City, Calbayog City and Cebu City. His tour of duty was cut short when he contracted malaria and dhobi itch during a survey at Bataan in October 1904. 2. MacArthur became a Defense Advisor to the Philippine government after retiring from United States Army in 1937. His job was to advise the Philippine government under the President Manuel L. Quezon on defense matters he prepared the Philippine’s defense before we become fully independent. Philippines might have felt more like a second home to MacArthur than a mere place of assignment which explains why he was very earnest to return and fulfill his promise to free the Filipinos from the Japanese. But whatever his reason behind pushing the idea of taking back the Philippines we all should be grateful for his efforts to liberate us and in a way change the history of the whole world. We should also honor not only the soldiers but everyone who helped during the World War II in whatever way they could just like the brave Boy Scout from Tolosa who risked his own life to save the lives of the civilians in his hometown.